Jan agreed to lend her time and knowledge in an effort to rescue the remaining puppies and female dog. Anxiously we set out for our location that Saturday morning. I had secured a live trap from the local shelter, just in case the rescue required a more clever plan. Jan thoughtfully provided towels, a wire pen, and cans of wet dog food. Upon arrival, we immediately saw the puppies sitting near the barn. With great anticipation, we carefully unloaded our rescue tools, not wanting to startle the already wary pups. As we approached, the two little guys ran under the shelter and quickly disappeared. Jan and I setup the pen near the main entrance, placing the smelly dog food inside the gated space. Jan circled the deteriorating building and decided that the animals must have ventured inside through one of the tattered wooden boards of their collapsing hideout. Opening the creaking door, we found the inside crowded with old furniture, broken tools, gas tanks, and other long forgotten possessions. Dog feces also covered the floor, indicating that this indeed was “home” for the puppies and mama dog. Mama Dog was hiding but also seemed relieved to hear friendly voices. Cautiously entering, Jan disappeared as I remained near the wire pen in case one of the pups retreated in my direction. I waited….and waited some more. My nerves were getting the best of me so I made the decision and slowly entered the barn. Stepping through the clutter, I saw Jan standing quietly in the shadowy corner… just beyond her hand sat mama dog. 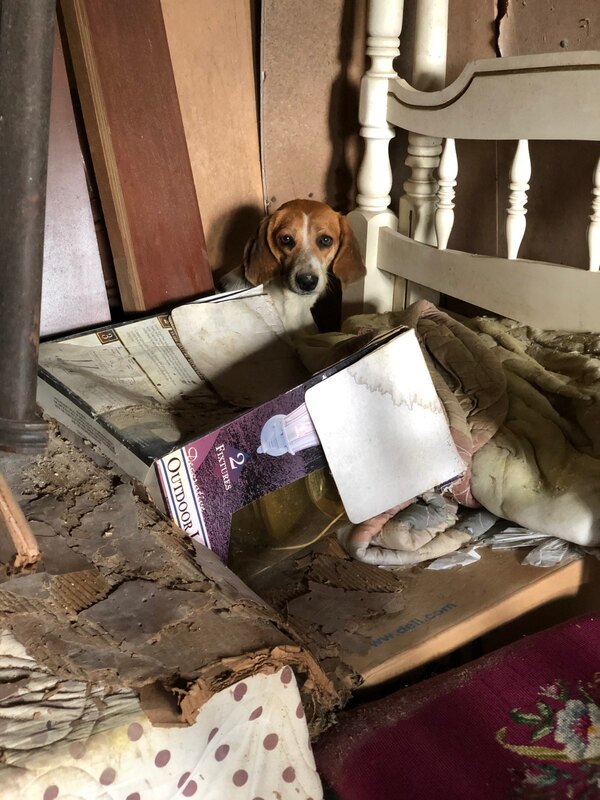 Lodged behind two bed frames, cardboard boxes, and haphazardly stacked chairs, the protective hound was shielding her pups from this intimidating and strange encounter. And although uncertain, she was also receptive to Jan’s caring touch. “She’s letting me pet her… I think she’s ready,” Jan said in a whisper. I prepared a leash, looping it for Jan so she could slide it easily over the mama dog’s head. Mama sat motionless, almost as if she were waiting for her instructions. Jan and I switched positions so this sweet pup could walk to the security of Jan’s arms from behind jumbled mess. Gingerly picking her up, Jan carried the timid dog to the car. Now for the puppies… reaching behind the chaotically thrown contents of the barn, while also trying to reach uncooperative puppies, proved a bit challenging. When I did finally secure the tan and white pup, his wicked shrieking was just as horrible as Bucky’s screams a few days earlier, and once again stunned me. Without having time to think, I swiftly raced in the direction of the car with my newly capture and extremely resentful puppy. His squirming and loud protest against my efforts were overwhelming! Jan rush to me, taking the puppy carefully in a towel to better protect herself from the unpredictable and terrified dog. Together we safely placed him into the crate with his mom. We returned to the barn knowing this was going to be the most challenging moment. Slowly Jan and I had taken away every bit of safety this puppy had ever known. I can only imagine what he thought of us as we searched for him in the mess he called home. He had cautiously relocated himself further back in the overly crowded barn. I spotted him and saw the frightful desperation in his eyes. This wasn’t going to be good… or easy… or safe. Jan went one way and I the other as he had backed himself into a difficult position. Jan step over and under furniture pieces and was just barely able to reach him but this one wasn’t going without a fight. With a flailing mouth and chomping teeth, he recklessly bit in every direction possible. Somehow, with our own hearts racing, we managed to somewhat secure him with a towel and swiftly delivered him to the car. Finally safe in a crate. With the crate door finally shut and locked, Jan and I allowed ourselves to breath with relief. “Oh my God,” was all I could say. I was so thankful for Jan’s calming demeanor. It didn’t simply help the rescue, but it supported me as I regained my own composure. I returned to the barn to collect our items as Jan spoke with the family, sharing our rescue group’s contact information. The two-mile drive home provided me with a few moments to release the anxiety I held inside since the moment we first set out for this expedition. Was I ready to take on these dogs that were clearly terrified of humans? Jan must have read my mind because she asked me that very question as we prepared to move the pups to their new kennel. “How will they survive without our help?” was all I could say… somehow, I’d make it work. 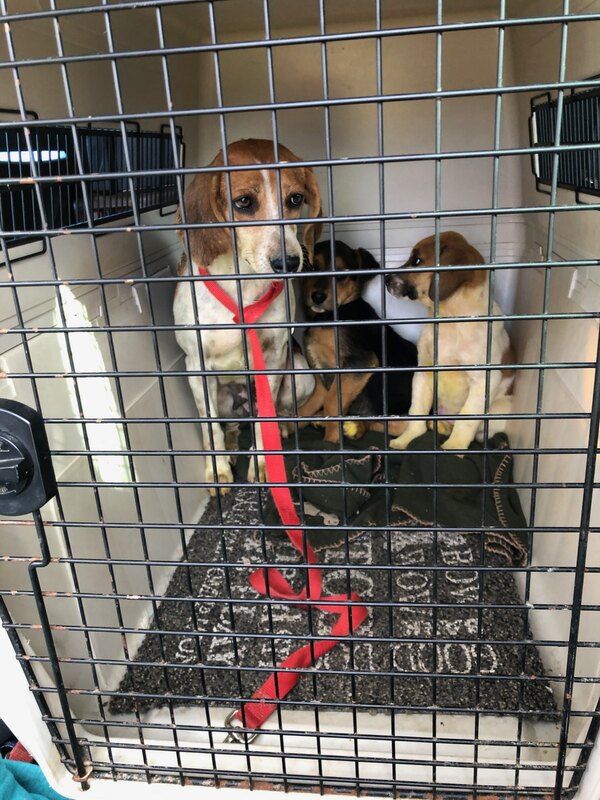 As we carried the crate with two puppies and one mama dog to the kennel, I expected a joyful reunion with the first puppy rescued a few nights before. Keep in mind, this puppy we called Baby Bucky, still refused to look at me or acknowledge my presence despite the hours I had sat with him. We opened the crate door and mama dog carefully made her way out, smelling her new space. She gradually closed in on her missing puppy…. and then a fierce little growl erupted from the tiny dog house that hid Baby Bucky… now what? The rescue seemed to be successful but that’s not where their story ends… visit next week to find out what happens as Bucky and his family are reunited.